The story begins in 2004, in those dark ages when hand-held tablet PCs were still (mostly) science fiction. At that time, the HML team was imagining ways to overcome what they saw as one of the PC’s biggest limitations: the screen. “The limited screen real estate on computers requires windows,” says Roel Vertegaal, professor of human-computer interaction at Queen’s University’s School of Computing and director of the HML. “Separating off a limited set of pixels on one display can become very cumbersome when you have many different task environments.” I know the feeling; I generally have dozens of browser windows open at once, and it can be maddening trying to find the one that’s suddenly started playing an annoying ad spot. Paper, on the other hand, makes use of our species’ inherent ability to file things based on proximity and touch. “This whole idea of hot documents that you hold in your hand, warm documents that are nearby and cold files which are further away in your desk or in your file folder really became an operating metaphor,” says Vertegaal. The team’s first attempt to explore this idea – called PaperWindows – used projectors and advanced tracking technology to turn actual pieces of paper into interactive task environments. Although it may seem clunky by today’s standards, the above video (which actually predates YouTube) demonstrates a system by which documents could be manipulated by rotating the paper vertically or horizontally, and transferred from one sheet to another by touch. “Having multiple displays allows you to multitask more efficiently,” says Vertegaal. “One of the reasons why people print out on paper still is because it allows you to compare documents, copy from one document to another and read while annotating. You can have many tasks stacked on your desk as kind of reminders, which you can easily grab and load into your mind, so to speak.” But projectors aren’t easy to pick up and carry, and they don’t work well in outdoor lighting. The team had to wait almost ten years for science to come up with another solution. 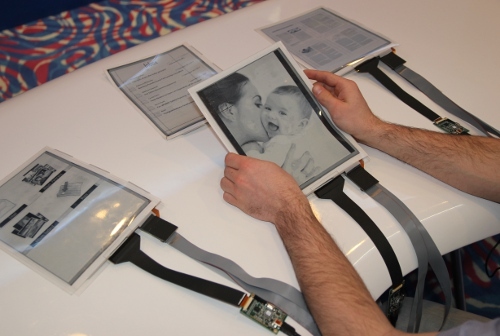 Enter Plastic Logic, a British company that manufactures bendable, interactive displays. Their technology, which is based on a backplane of plastic electric transistors and the same E Ink technology used in the Amazon Kindle, is the only kind in the world that allows for displays the size of traditional A4 (8.5” x 11”) sized paper. 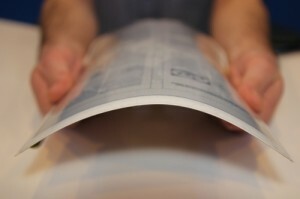 Instead of rotating, the displays are fitted with sensors that detect bending or folding, allowing users to access the inherent hapticity of paper. “I can pick up a PaperTab window and hit a button by folding the display, all without actually looking looking at it,” says Vertegaal. “I challenge you to do that on a computer screen.” By enabling us to use senses beyond sight, the HML team hopes that PaperTab will make computers into more of an extension of the body than is currently possible with screens. Vertegaal admits that PaperTab has shortcomings; for one thing it’s currently not wireless, although he says that could easily be done. I also notice that the displays seem slower and less responsive than the touch screens that are now ubiquitous around us: for example when a user drags an object from one PaperTab to another. Were it not prohibitively expensive, I almost feel like you could get the same effect with ten iPads, although Vertegaal insists that slinging around ten heavy displays would be impossible and that by contrast the PaperTabs are admirably lightweight. Besides he says, we shouldn’t think of PaperTabs as an evolution of the tablet PC, but rather an evolution of paper itself. “Rather than trying to get rid of paper, we decided to make a computer that’s like paper. If you can’t beat ‘em, join em,” he quips.